Few evaluations of social programs have demonstrated positive results. Part of the problem may be that program teams and evaluators often conduct rigorous summative evaluations of programs that are not actually ready for that level of scrutiny. 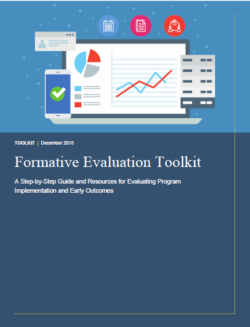 This toolkit introduces formative evaluation, a method for evaluating programs during early implementation to inform program improvement and assess readiness for rigorous summative evaluation. The toolkit is designed primarily for child welfare agencies and professionals to use in partnership with program evaluators, but others in human services may also find it useful. The content aligns with the experiences of state, local, and nonprofit child-serving organizations and evaluators funded through the Children’s Bureau discretionary grant program.